Fajita ingredients, stir fry style. Cook the rice according to the box. While it’s cooking, saute the chicken in one pan. Chop the onions, peppers, and mushrooms into bite sized pieces and saute them in a separate pan. Once everything is cooked, combine in the largest of the pots/pans. Sprinkle cheese on top or mix it straight in and feel free to add cilantro and/or avocado on top. Serve with salsa (we used spicy homemade tomatillo salsa) and enjoy! This main course was an experimental meal that I made for my mom, and she loved it! 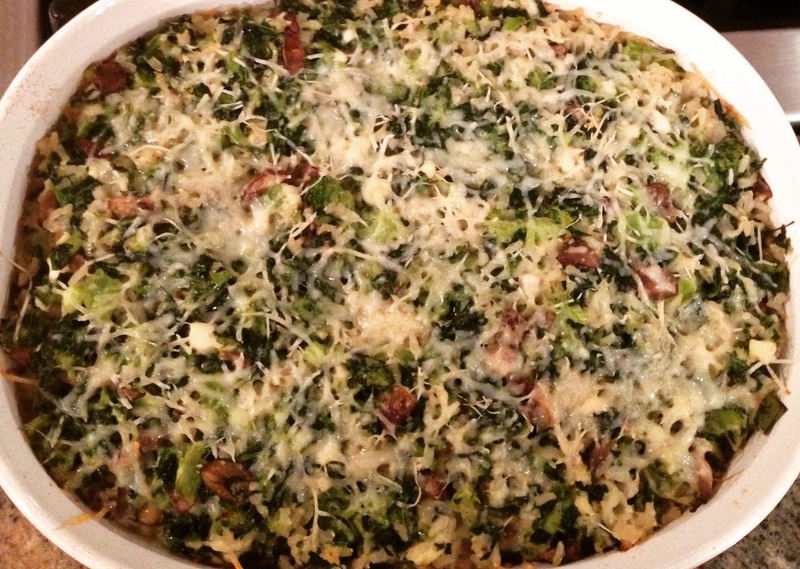 You could experiment with adding other vegetables to the casserole and varying the amount of cheese in the dish; it’s sure to be delicious no matter what. For the casserole, cook brown rice as directed on the package. Allow spinach to thaw and drain the water using a strainer. Chop mushrooms, broccoli, and scallions into small pieces. In a bowl, whisk the eggs, milk, and Worcestershire sauce, and add a pinch of salt and Italian seasoning. Stir in the scallions, mushrooms, broccoli, and spinach. Then add in the feta and 1/2 cup of Parmesan. Finally, add in the rice and mix well. Pour into a casserole dish (ours was 1.5 quarts) and bake on 350 covered for 30 minutes. It should be warmed all the way through with the cheese beginning to melt. Sprinkle the remaining 1/4 cup of Parmesan on top and return to the oven, uncovered, for 20 minutes, so that the cheese on top is beginning to brown. Here’s a photo of the casserole just out of the oven! While the casserole is baking, prepare the chicken. Cut the breasts into 1-2 inch pieces, sprinkle with garlic pepper, and saute on medium until mostly cooked – it’s okay if they are still pink in the middle. Remove the chicken from the pan, and saute the scallions for a few minutes. Then add in the diced tomatoes and balsamic vinegar. Return the chicken to the pan and allow to cook on medium for another 5-10 minutes, or until the chicken is cooked all the way through. Let the chicken simmer until the casserole is done, and then enjoy the two together! After a visit to Nicaragua where we were impressed by the food, we decided to try making our own Nicaraguan meal. As a side note, you can get incredibly sweet mangoes for about 5 cents each there! Definitely worth the plane ticket. Anyway, this is a classic Nicaraguan breakfast, but we made it for dinner. 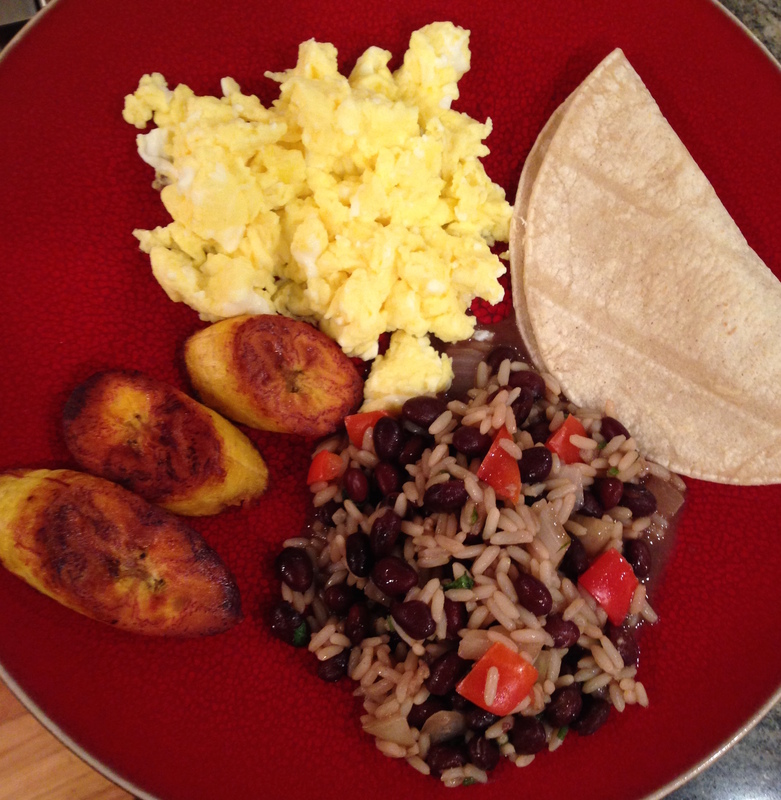 The main course is gallo pinto, scrambled eggs, tortillas, and fried plantains. We served the main course with a fruit salad of watermelon, pineapple, and banana, as well as the national cocktail of Nicaragua, macuá. Gallo pinto (translated to painted rooster) is a combination of rice and beans, a staple in Nicaragua and much of Central America. The sauce traditionally used to make the dish is called Salsa Lizano, but unfortunately it can rarely be found anywhere outside Central America. We made this dish with Worcestershire sauce instead, which worked surprisingly well, but we will order Salsa Lizano online for our next go at it. Saute onion, pepper, and garlic in canola oil until soft. Add beans and rice and allow to heat up. Add Worcestershire sauce and cilantro and mix well. Serve with scrambled eggs, tortilla, and fried plantain. Plantains are hugely abundant in Central America, but much harder to find in the US. Ideally, the plantains will be very ripe – this means that the skin is dark brown. However, we used plantains that were yellow and beginning to turn brown, and the dish was still delicious. We fried these plantains in 2 batches, in a medium-sized frying pan. Slice the plantains diagonally into disks that are about 1/2-inch thick. Lightly sprinkle sugar on sliced plantain. Pour half the oil into the pan and allow it to heat up on medium heat. Place the plantains into the frying pan and allow to cook for a few minutes on each side. They are done when both sides have a well-done brown color. Fill shaker halfway with crushed ice. Pour in all ingredients and shake. Serve over ice.